City of Orlando using temporary interventions to study long-term enhancements to pedestrian and bike infrastructure. Beginning this month, Orlando officials will temporarily test a half-mile road diet concept along Curry Ford Road, from S. Bumby Avenue to the east, to S. Crystal Lake Drive. This experiment in tactical urbanism will last for four weeks, during which time City officials will conduct analysis along the corridor to determine any changes in user behavior- with the hope to use this information to shape a permanent road diet in the near future. As part of the project, the city is proposing to temporarily reduce travel lanes and add bicycle lanes in both directions, as well as installing new crosswalks. The project is an outgrowth of the City’s participation in Smart Growth America’s Safe Streets Academy, a technical assistance program that brings together engineers, planners and related professionals from different jurisdictions to provide education in identifying the factors that contribute to high crash corridors and the countermeasures that can be applied to reduce crashes. Additionally the academy looks to implement solutions and placemaking measures for the purposes of enhancing pedestrian and bike safety. The demonstration project on Curry Ford Road will showcase the application of Complete Streets principles and promote bicycle and pedestrian safety initiatives, through temporary improvements that will increase multi-modal safety and connectivity along the corridor. The findings from the project will be used as a model for Smart Growth America to share with other cities looking to implement innovative solutions for their transportation woes. The month-long demonstration and evaluation project will cost about $75,000, split between the City of Orlando, Orange County, Smart Growth America and a federal transportation grant. This is not Orlando’s first experience with testing road reconfigurations. Not widely known, but Edgewater Drive received a similar temporary treatment nearly two decades ago. Edgewater Drive, the main commercial arterial among Orlando’s College Park neighbourhood, is widely held as a model road diet in Florida. The four-lane road carried more than 20,000 motorists per day, and experienced vehicular crashes nearly every three days and injuries every nine days. Local stakeholders began a process in 1999 that sought to transform Edgewater into a thoroughfare that would be safer while also including ample space for pedestrians and bicyclists. 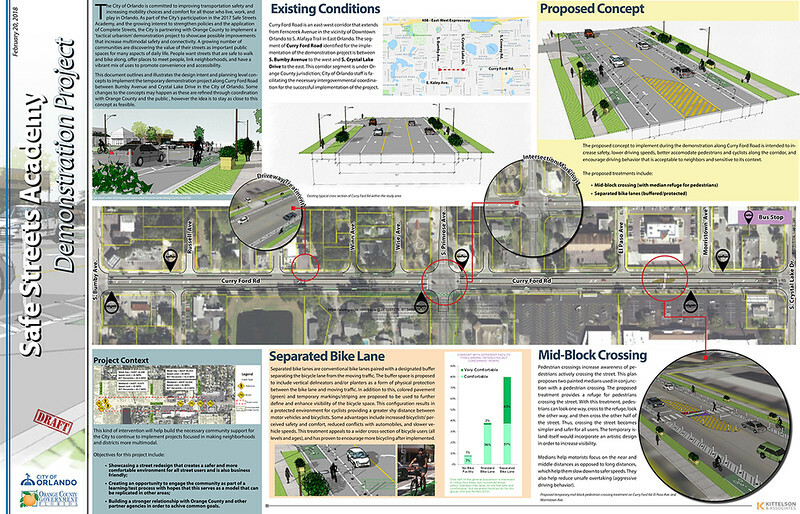 Coinciding with a scheduled resurfacing project in 2001, community advocates along with state and local officials formulated a plan to implement a road diet along a 1.5-mile stretch of Edgewater between Par Street and Lakeview Street. FDOT agreed to pay for the reconfiguration of the road in conjunction with the lane restriping project, provided that the ownership of the street would be transferred from FDOT and into local control. Once the City of Orlando gained control of Edgewater Drive, local officials used tape to simply restripe the road- performing before-and-after analysis examining vehicular speed, traffic volumes, bicyclist volumes and travel times. Satisfied with the results, a permanent re-striping was installed in 2002. One vehicle lane was removed (from four lanes to three), with a center two-way turn lane, and both bike lanes and on-street parking stalls were added.